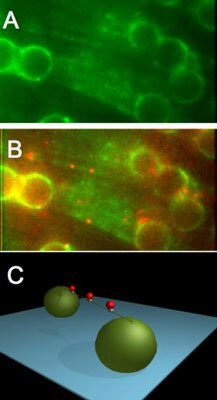 (Nanowerk News) Repair proteins appear to efficiently scan the genome for errors by jumping like fleas between DNA molecules, sliding along the strands, and perhaps pausing at suspicious spots, say researchers at the University of Pittsburgh, the University of Essex and the University of Vermont who tagged the proteins with quantum dots to watch the action unfold ("Collaborative Dynamic DNA Scanning by Nucleotide Excision Repair Proteins Investigated by Single- Molecule Imaging of Quantum-Dot-Labeled Proteins"). The study was funded by the National Institutes of Health, the Royal Society and UPCI. Hong Wang, Ph.D., of UPCI and the University of Pittsburgh School of Medicine, and Guy G. Kennedy, of the University of Vermont's Instrumentation and Model Facility, co-authored the paper.